With so many options on the market, we at EBD want to make sure you have the best variety of eyeglass frames to choose from. That’s why we take so much pride in our detailed design and manufacturing process. Combining creativity with practical engineering, we work tirelessly to bring you the best selection of eyeglass frames available. The whole process starts at the drawing board. Our designers are always on the lookout for some new source of inspiration to bring to the table, from social media trends to historical icons. Whether they’re classic styles, current trends or simple sparks of creativity, we bring everything into the design phase, creating detailed designs and adding our own unique take to each pair of eyeglass frames. 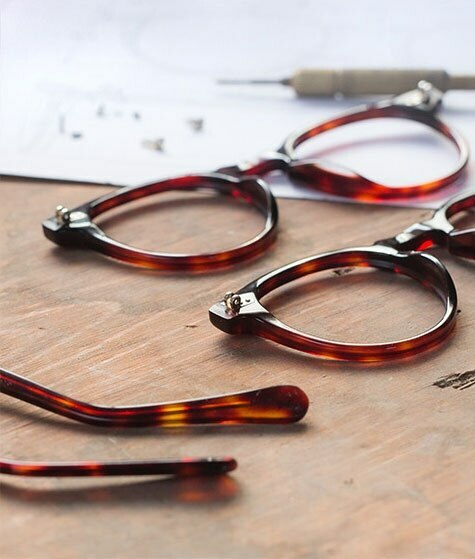 From frame type to the color, we put much thought into a new pair of eyeglasses. Throw in the type of material and the styles that we can choose from and our imaginations start running wild! Of course, we check the current eyewear trends and take a few mock-ups from the drawing board to the next step. Once we have a few designs we like, we finalize the design phase and start creating models. These prototypes help us work with our original designs to make frames that are as comfortable as they are stylish. We work out any kinks, finalize every detail — from the accents to the final shape — and, with the final samples in hand, we move on to production. At the production stage, we finalize everything about our frame designs, from colors and patterns to hinges and nose pads. Once everything is ready, we start producing new eyeglass frames, bringing you yet another unique and stylish option from our catalog.